The Galaxy S8 might not boast the iPhone’s fancy dual-sensor setup, but its 12MP camera is nothing to shake a stick at. It ranks third on camera benchmarking site DxOMark’s list of top-ranking smartphone cameras, the second-highest score ever achieved by an Android phone. In our testing, the Galaxy S8, manage to capture clear, color-accurate shots pretty consistently. That said, taking exceptional photos with the Galaxy S8 isn’t as easy as whipping it out of your pocket and hitting the shutter button. It’s worth learning a thing or two about close-ups, wide shots, high dynamic range (HDR), and filters. Once you master the basics, you’ll be well on your way to producing DSLR-quality snaps with the Galaxy S8’s camera. Here are a few Samsung Galaxy S8 camera tips and tricks that’ll help you make the most of the the phone’s camera. Zooming in with a smartphone camera can be a two-handed pain in the rear, but the Galaxy S8’s app makes it easy. When you want to enlarge a portion of the frame, tap and drag the shutter button to the right — it’ll turn into a horizontal slider that shows the current zoom level. Quickly capturing a burst shot with the Galaxy S8 is even easier. Just tap and hold the shutter button, and that’s it — you’ll find the photos in your gallery. The Galaxy S8’s camera app is a little overwhelming, at first glance, but Samsung has made an effort to trim the fat. A swipe left pulls up a wealth of different modes, including Auto, Pro, Panorama, Selective motion, Hyperlapse, Food, and virtual shot. Auto, the Galaxy S8’s default shooting mode, handles everything for you. It’s a point-and-shoot affair. If you know your way around a camera and want to make the most of the Galaxy S8’s snapper, Pro mode will suit you fine. It puts settings like the ISO, aperture, IRIS setting, autofocus, white balance, and exposure at your fingertips. One of the most useful is manual focus mode, which draws green lines in the viewfinder over the object that’s in focus. The Galaxy S8’s panorama mode stitches multiple shots together into a single, ultra-wide photo. Selective focus, a feature introduced on the Galaxy S5, snaps multiple photos consecutively with varying focus. The end result is a photo with an adjustable focus level; you can swap focus between objects in the foreground or background. 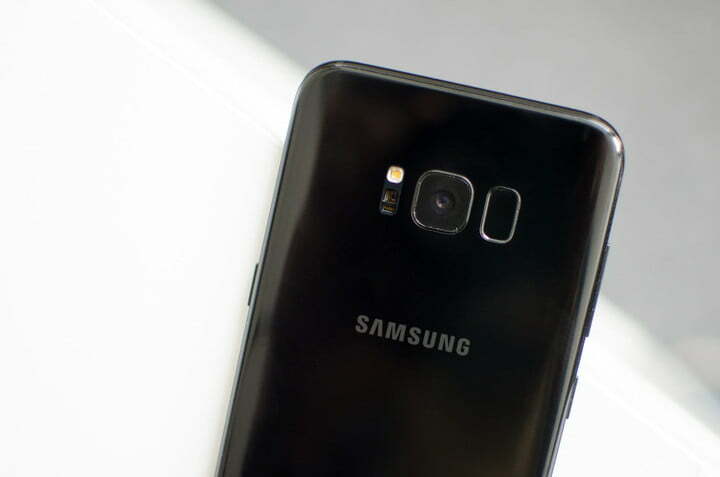 The Galaxy S8’s slow motion mode captures videos at a higher-than-normal frame rate (240 fps compared to 30 fps or 60 fps), which has the effect of making things seem “slower” when played back at normal speeds. You’ll have to settle for a lower resolution than normal-speed video — Slow Motion mode maxes out at 720p — but the effect is worth the sacrifice. Hyperlapse lets you create time lapse videos, or clips that compress hours of footage into a few sped-up, super-fast minutes. Samsung says it’s smart enough to adjust to what you’re recording automatically. Food mode is optimized for pictures of delicious grub, as you might expect. Activate it, and you’ll get enhanced color, contrast, and blur effects that make everything fancy. A handy tip: Moving the circle in the viewfinder adjusts the level of background blur. Virtual shot isn’t the most useful mode in the Galaxy S8’s arsenal, but the effect’s neat. Basically, you move the camera in a circular motion around an object as your phone snaps pics. Then the Galaxy S8 stitches photos together in an animated file. There’s more to the Galaxy S8’s camera app than shooting modes. Swiping to the right of the Galaxy S8’s camera menu brings up the filters, effects, and overlays section. It’s a lot to unpack. Tap the bear-shaped icon to access the effects menu, which consists of Instagram-style filters and stickers that lay atop your photos (think stylized titles like “Best friend,” “Cool,” “Enjoy,” and “Happy Anniversary”). , which occupy the same menu, are like Snapchat Lenses. They’re digital masks, bunny ears, sunglasses, tiaras, and party hats that sit atop people’s faces. It’s like augmented reality, but without the need for a third-party app – they’re built right into the Galaxy S8’s camera app. If you’re not happy with the default selection of filters, effects, and overlays, you can download additional stamps, face masks, and more from Samsung’s Galaxy Apps store. Note that not all are free, though — you’ll have to shell out cash for some of them. If snapping pictures with the shutter button is starting to feel old hat, good news: The Galaxy S8 lets you trigger a photo with voice commands, palm gestures, or even your face. To enable voice controls, head over to the camera app’s settings menu and tap the Voice control. There isn’t much in the way of customization, here, but you can trigger a photo by shouting words like “smile” and “cheese.” Saying “record video” switches the camera to video mode. Alternatively, you can use a finger. When the front-facing camera’s active, placing your finger over the heart rate sensor on the back of the Galaxy S8 (opposite the side of the camera module) snaps a shot. It’s not always consistent, but it’s easier than trying to tap the shutter button one-handed. Holding out your palm works, too. With the camera in selfie mode, hold out your palm when you’re framing the shot. The Galaxy S8 will automatically set a short countdown timer to take a photo. If you’re not entirely pleased with the way your selfie turned out, the Galaxy S8’s camera app can help you tweak it. Swipe down anywhere in the frame to switch between the Galaxy S8’s front camera and rear camera. Then swipe to the left to get several different shooting modes: Selfie, the default; wide selfie, a wider-angle mode that makes it easier to fit a multiple people in the frame; and selective focus, which blurs out your photo’s background. There’s more than angle adjustment, here. Tap the brush-shaped icon when the Galaxy S8’s in selfie mode and you’ll get options to tweak your skin tone, face and eye shape, and backlighting. Once you settle on the right combination of settings, snapping a selfie’s as easy as hitting the shutter button. Tired of having to switch to a different mode every time you launch the Galaxy S8’s camera app? Good news: The Galaxy S8’s shortcuts feature lets you pin frequently used modes to the home screen. Once you’ve selected the mode you want, tap the three-dot menu in the upper right-hand corner and hit Add shortcut to home screen. Select your favorite modes, and that’s it — you’ll see them on your home screen, where you can rearrange them just like app shortcuts. Having trouble reaching the Galaxy S8’s shutter button while you’re trying to capture the perfect shot? Not to worry — just like Samsung’s Galaxy S7 and Galaxy A5, the Galaxy S8 lets you move the shutter button to a more convenient screen location. First, though, you’ll have to enable it in the settings menu. Head to the Galaxy S8 camera app’s Settings and tap the Floating Camera button. Then, it’s as easy as pressing and drag on the shutter button with a free finger to a spot that’s easier to tap. There’s a lot more to the Galaxy S8’s camera app beneath its colorful icons and animated graphics. Dive into the settings menu, and you’ll see options to tweak the video resolution, preview pictures before you save them, and more. From the camera app’s settings menu you can change picture size and video size. In terms of the former, you have the choice of 12MP all the way down to 1:1. When it comes to the latter, the Galaxy S8 can shoot up to Ultra HD (3,840 x 2,160 pixels). Not every picture’s perfect, which is where tracking AF and shape correction come in. Tracking AF focuses on and tracks a subject you selected on the preview screen. Shape correction, meanwhile, reduces distortion at the corners of the S8’s screen at the cost of resolution. By default, the Galaxy S8’s selfie camera flips saved images to show you how you really look. Flipping the toggle shows the true photos, instead. You can trigger the Galaxy S8 to take a photo after a few seconds. Motion photo is the Galaxy S8’s version of the iPhone 7’s Live Photos. Toggle the setting, and you’ll get a short video clip of what happens before each picture was taken. Enable quick launch to open the camera by quickly pressing the power button. The Galaxy S8 packs more than a powerful camera app. Once you’ve snapped a few shots, switch over to Samsung’s photo-editing tools by launching the Gallery and tapping the Edit button. Transform lets you rotate, flip, mirror, and crop a photo. Tone packs brightness, exposure, contrast, saturation, hue, and white balance adjustment tools. Advanced lets you run wild with a photo’s tone curve, color, and backlight. It’s a little tricky to get the hang of, but affords you the most freedom. Effects puts all of the Galaxy S8 camera app’s effects in one place, which is useful if you forget to apply an effect before you snap a photo. Decoration lets you overlay things on a photo — you can add images, stickers, labels, and covers, or doodles with your finger.